City Improvements are Rockin’ It! Mazatlán has a bumper crop of city renovation and development projects underway, and I have been remiss, posting to VidaMaz’s Facebook page about several of them, but failing to actually upload them here to the blog for you who don’t follow us on social media. The first project is championed by Pueblo Bonito’s Neto Coppel. He announced his plans to build a new state-of-the-art museum several months ago, and we shared those press releases. The new museum will be built on the site of the current Teodoro Mariscal baseball stadium, (if) and when a new stadium is built up north in the marina. The overall project, called Parque Central or Central Park, is planned for the current site of the Bosque de la Ciudad, City Park, just behind the malecón between the Aquarium and Avenida Insurgentes. I love how the estuaries are actually expanded rather than contracted in the plans, and I also adore that we will have another frontage road to Avenida del Mar—permitting access during street closures such as Carnavál parades and marathon. The plans include pedestrian and bicycle access to the park from the malecón, which will be terrific for locals and tourists. The plans, I’m sure you’ll agree, look marvelous! This will be a huge addition to our gorgeous city! Click on any photo to view it larger or see a slideshow. The second project I want to be sure you know about is already under construction. It is the renovation of the historic outdoor pool in Olas Altas. For the past several weeks the area has had a plywood wall blocking access, and work is proceeding to upgrade and update the pool. Below are the architects’ renderings of that project, as well as a couple of photos of the site from the Mayor’s office. Again, I’m sure you’ll agree this project is a huge improvement. It will be wonderful to have a public swimming pool with such an incredible view. This is a project that will be a terrific asset to families in our community, and it will showcase Mazatlán on the world stage—seaside pools gain a lot of attention. I’ve posted photos of workers cutting the cement of the malecón in order to plant the palm trees, which it seems were gifted to the city by Stone Island. I then posted photos of them installing lighting. There has been a lot of pushback by residents who don’t like the new palm trees. Some complain they provide no shade, others that they ruin the open view of the ocean. Personally, I absolutely love them! I believe they add a sophistication and cared-for look to our beloved oceanside promenade, which I believe is the longest in the world. As I write workers are installing lighting in front of our condo building, but the first stretch of lighting, from Valentino’s to Las Gavias, has been completed. Photos from the Tourism Office are below. By now you know we have new soccer fields and basketball courts in the grassy center of the boulevard along city park. Just recently they have finished two new, gorgeous tennis courts, and I am told the city will be offering tennis lessons to the public. Thus far they go very under-used, so get out there and play! Between the new courts and the Kilometer Zero art installation are new weight and exercise machines that have been installed. These are obviously built for outdoor use, but my guess is they won’t last long in this salty air unless they are scrupulously maintained. Get to them and work out while you can! At 6:30 am yesterday when I went by, a young man, a trainer, was there instructing people how to use it. Finally, I reported on our social media several months ago when the Mayor announced rehabilitation of the Golden Zone. Improvements include new sidewalks, which are gorgeous, by the way! They installed the new undulating wave/resin and concrete sidewalk in front of the Hotel Playa a week or two ago. I failed to get a photo of it when I saw it, and now it has been all torn up as city workers install new cable for lighting. Poor planning, sadly. The Golden Zone should be finished by February, they say, and in addition to curbs, sidewalks, lighting and landscaping, we pray they’ll be working on drainage. Flooding in that area is horrible when it rains, primarily due to the fact that most of it is reclaimed land. Some residents complain that all these monies could better be spent on drainage, sewage, road repair, etc., but nearly every day on the Mayor’s page on Facebook he shares with us yet another paving or water project in one of the city’s many colonias. He does, indeed, seem to be doing what he promised our municipality when he ran for office! I, for one, am very excited. Feliz Día del Mesero! A Waiters’ Race Like No Other! Many times I’ve seen the photos, from Italy, I believe, of waiters running through the streets carrying trays full of things. I’ve always wanted to see one. A few years ago I remember hearing about and attending one here in Mazatlán, just prior to the Marathon, but it wasn’t that exciting. This past week, Tuesday October 22, was the “Traditional Day of the Waiter,” and a party was hosted at BoraBora to honor these terrific people who make all our lives so much better. One of the events was a race, beginning at Bora Bora, running down the heavily trafficked Camarón Sábalo AGAINST traffic, I might add. They ran all the way down to Panamá restaurant, then turned around and ran back. The winner won a big-screen TV and some money, so it was quite the competition. Photos are below; click on any to enlarge or view a slideshow. What a load of fun! We are really glad we showed up to watch, as it was a hoot! The photos and video aren’t the greatest, as it was dark and the area is not exactly well-lit. A few botargas or “mascots” also joined in the festivities and had their own race. It was hysterical as they tried to flag down buses, cabs and cars. I post a video with exerpts from the race below. Pechakucha Makes it to Mazatlán!!! 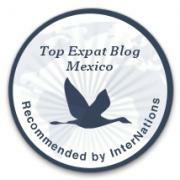 You know that Greg and I have been so excited by the younger, hipper, more creative energy taking over Mazatlán lately. We’ve written to you about cool new restaurants, activities and programs. It is very exciting, and the energy is palpitating. 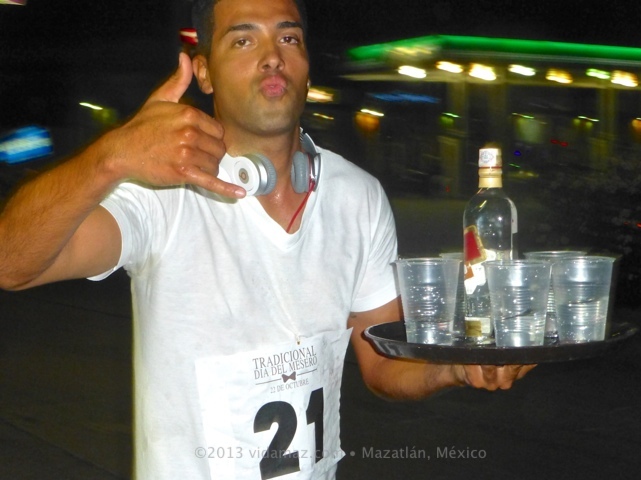 It is our dream that it will take us to a point where we reclaim what is uniquely Mazatlán, rather than wasting energy trying to imitate Vallarta or Cabos or feeling jealous of Cancún. Building on this theme, I was ecstatic to see that the worldwide “Pechakucha” movement has finally made it to Mazatlán! Started as a one-off event in my beloved Tokyo in 2003, Pechakucha has spread worldwide, and remains a grassroots effort. The basic theme is for creative people, whoever they may be—architects, artists, designers, musicians, filmmakers, you name it—to present 20 slides for 20 seconds each slide. The idea is that in 6 minutes and 40 seconds, they give us a solid feeling for what they’re working on, what they’re proud of, how their creativity works. And maybe, just maybe, that stimulates some other ideas for those in the audience, some cross-pollination, some interdisciplinary creative breakthrough. 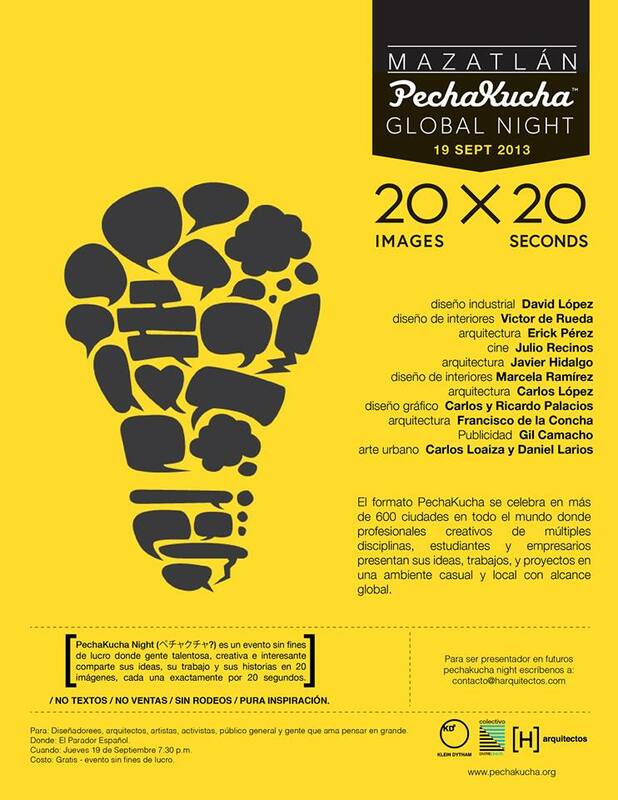 Pechakucha Mazatlán was held on Thursday, September 19, as part of a global event series of 600 same-day events. Come on now, for a global event of 20 slides in 20 seconds, don’t you think it should have been held on Friday the 20th? The event was held in the bar area of El Parador Español in the Golden Zone. It was very well attended; our guess is about 150 people crammed into the space. And, it was definitely a young crowd; while Greg and I were not the oldest, we definitely stood out. But it was oh-so-much-fun! Our favorites, as always, were CrisArth’s Carlos Loaiza and Daniel Larios. You have seen many of their urban art paintings here on this blog, from random street scenes to Día de la Música live video. They are terrific artworks, and bring a values-based message to our streets. They have done unbelievably good work in this city, IMHO. Kudos! Another favorite was the presentation by my favorite local singer, Julio Recinos from La Falsa Orquesta Cubana Sazón. I didn’t realize that he is actually a videographer! And an extremely talented and successful one at that! We have so many multi-talented people in this city! The mosaic below includes a few of the presenters and slides. Click on any of them to enlarge or to view a slideshow.